It is Friday, you're sitting at home after work (please don't tell me you're reading this blog at work - that can get you into trouble), packing for a backpacking trip in the forest/ hills/ lakes/ all of the before mentioned and then one question shoots into your mind: What would Hendrik eat on a trip like this? Well, first and foremost, Hendrik wouldn't think on a Friday afternoon what he would eat on the next two days out - that is way to early late. Hendrik is well organized and plans weeks, even months ahead. Time to learn from him. 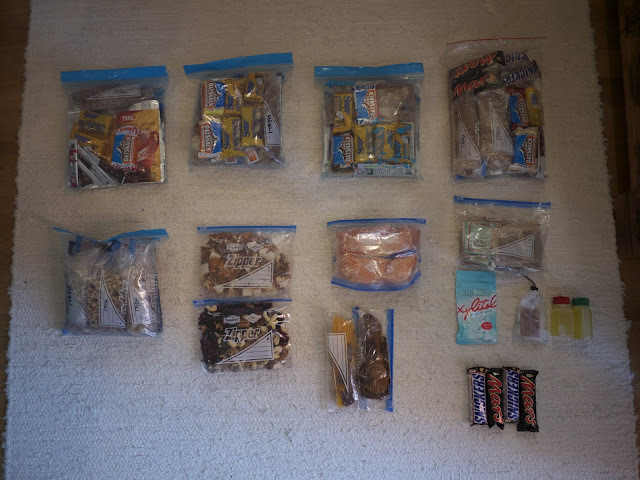 This is the food for Hendrik's ten days canoe/ kayak/ packrafting trip in Eastern Finland from May. Paddling up to 30 km a day was a new experience for Hendrik, and he used different body parts to go forward - not feet and a back to carry a rucksack, but his hands and arms to paddle him forward. Them students were recommended to take high protein food for this trip, and with his food partner he shared the lunches - she carried lunch for five days, and he did as well. Weights ya wanna know? Here we are. Hendrik was very pleased with the total weight and the weight of the days, Sun & Mon was a bit more heavy as he had a Travellunch Double meal which he took, those are inherently a tad more heavy. On top came the Chorizzo sausages above, which he didn't eat more than four of and then fed them to the garbage can. And as they had two possibilities on the trip to buy food, Hendrik bought some extra German Bratwürste, apples, bananas and chocolate, which made a nice "fresh food" addition to the diet. 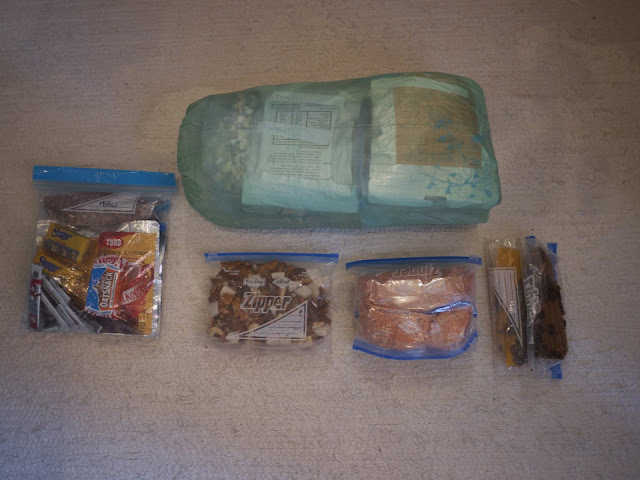 Ten days packed separately, each package includes the breakfast, snacks, coffee, tea and dinner for two days. Shared lunches, some snacks, nuts'n'berries and olive oil extra. All packed up except shared lunches and the first days. Happy about the compact size Hendrik was, lemme tell you! For the lunches and breakfast Hendrik went MYOG and created them myself: Müsli with dried berries, nuts, milk & cacao powder plus sugar for breakfast, spaghetti with dehydrated tomato sauce, tuna, salt and pepper and red lentils with a cup-a-soup. is the right size for him and gives sufficient energy for the first half of the day. Also for breakfast is a cup of Starbucks Via - hat tip to Phil who's the kind supplier! 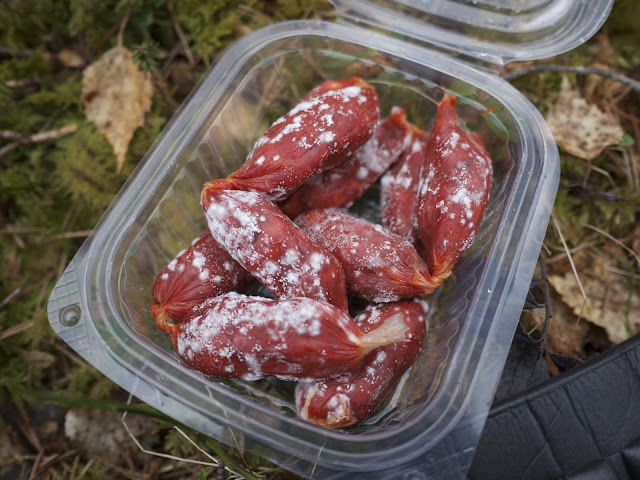 - and a satchel of Immunstabilität; which is giving a tasty dose of vitamins and minerals - something that often tends to come to short on trips, and Hendrik found them a good addition. Lunches were easy: 100 gram red lentils and two satchels of cup-a-soup were plenty for two people, and pretty tasty (at least Hendrik thought so, his partner found it good as she hasn't tried red lentils before). The other lunch was a tad more complicated: An oven (or dehydrator) was needed to dehydrate the dolphin tuna (take tuna in oil. Hendrik didn't look closely as he was shopping and grabbed tuna in water, which was OK, though tuna in oil is a lot better. There, you again learned from his mistakes!) and pasta sauce. You could make the pasta sauce yourself, though Hendrik was short on time and bought a tasty one (Parmesan Tomato Sauce ftw!) from the shop. 3 hours on 50 degrees = dehydrated tuna and sauce. Break into small chunks, give them another hour in the oven, while packing 150 gram of full corn spaghetti in a Ziploc, add salt, and then the tuna and sauce. To cook them, Hendrik just puts a good 800 ml of water in his pot, brings it to a boil and throws the whole thing in there, adds a bit of olive oil, lets it boil for ten minutes and Voilá ready is the meal for two! 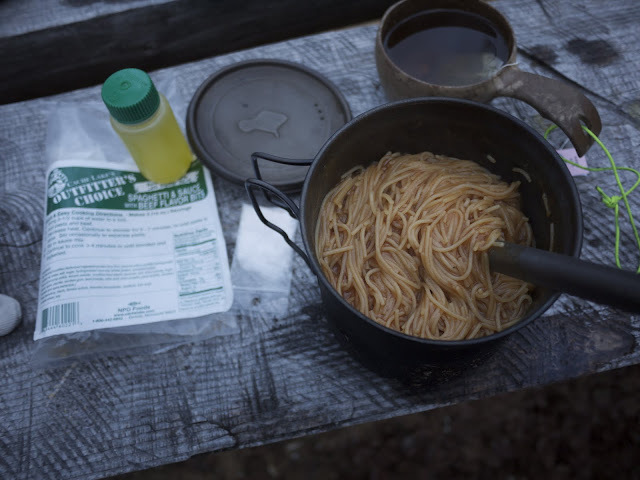 All dinners were freeze dried meals from Fuizion, Cache Lake Outfitters, MX3, Trail Foods and Travellunch - which almost all can be conveniently purchased at the OutdoorFoodShop.de from right there where you're sitting - MAGIC! It is something Hendrik did as well, because it is cheaper for him to purchase there & pay shipping than purchase locally. So why not make the meals yourself? It is a time question, really. It does take a good amount of time to prepare and dehydrate meals, and ten days is a lot of food to make, which would mean a lot of time spent on shopping, cutting, dehydrating, packing. Hendrik can do that, but he can do other things better with his time and hence preferred to get the ready made meals. He kept score of the different meals, and all were tasty, but the crown goes to the Fuizion Coq Au Vin, with the Cache Lake Outfitter's Spaghetti and the MX3 Chicken and Rice Tandoori sharing the second place. 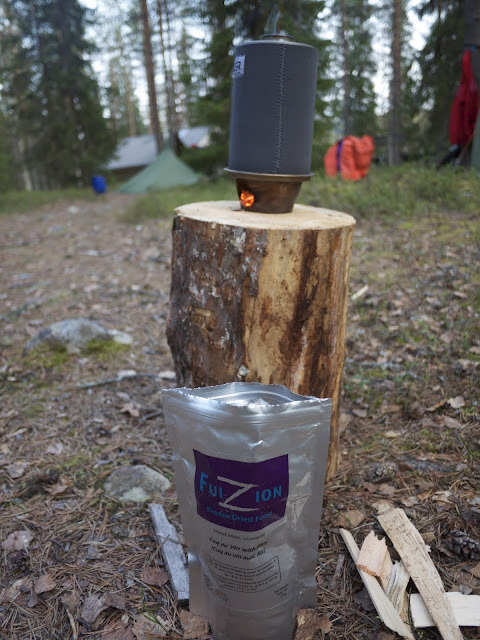 If you look for a few meals to try, give these a go - you won't be disappointed [Hendrik's wife tried on a winter snowshoeing day trip some Fuizion meals, and was mighty impressed by them as well =]! Wednesday - Leftovers - fruits and sausages! For snacks he had nuts, dried cranberries and blackberries (also known as blueberries), OatSnacks, sesame snacks as well as Snickers and Mars. 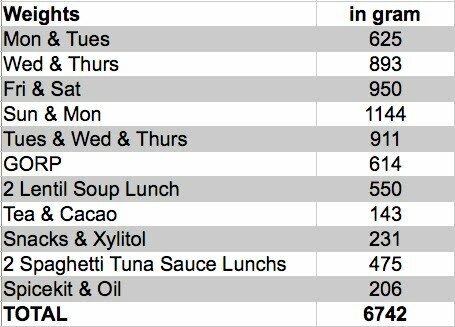 Those latter two are needed to fill Hendrik's appetite for chocolate, are affordable, and have a decent energy to weight ratio. And hey! - it is CHOCOLATE! Do you know how much the body & mind crave that stuff when you're outdoors for any time longer than two days?! The OatSnacks are pretty awesome and come in a variety of tastes, and can replace a full meal - yeah, they're that filling. Easy to make yourself as well, I hear, depending on where your time/ money/ preferences lie. He-who-shall-not-be-named (anymore) hopes that you enjoyed this post about food - he did enjoy eating and writing about it! If you did, consider backing his Kickstarter project where he plans to do similar awesomesauce - on video! Imagine the show: Fire, food, and Voldemort he-who-shall-not-be-named doing entertaining and educating things on video, it is something you don't want to miss out on!